Please contact me regarding the 2016 Great Dane High Spec - Stock# High Spec Dry Vans for sale at TruckerToTrucker.com. Take a look at this 2016 Great Dane High Spec. It is Stock# High Spec Dry Vans at TruckerToTrucker.com. GREAT DANE 53’ HI-SPEC BAD BOY DRY VAN. THIS IS THE NICEST DRY VAN BUILT. $35,700 FOB KEEWANE, IL. PSI tire inflation system, STAINLESS STEEL FRONT & REAR DOORS, 8 ALUM WHEELS, hat section anti-snag cross-members, ALUM ROOF, HARD TO FIND!!!!!!!! 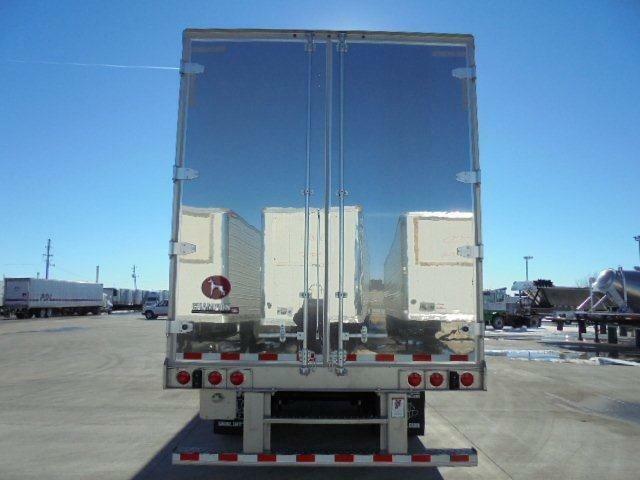 •	Overall Height-13’ 6” •	Overall Length-53’ •	Overall Width-102.36” •	Upper Coupler Height-47” •	King Pin-36” •	Front Sheets-.035” stainless steel •	Front Corner Sheets-.035” stainless steel •	Electrical Connector & Gladhand Location-Offset roadside, overlaid •	Hose Couplers (Gladhands)-Great Dane control & supply w/ red-blue urethane seals •	Document Holder-Great Dane standard with logo at roadside front •	Side Sheets-.050” aluminum, flat •	Side Uprights-Logistic, 0.503” “A” slot (14ga) single punched logistic hat section on 16” centers •	Rear Frame- Stainless Steel with 2.5” narrow header & rubber dock bumpers •	Rear Impact Guard-stainless steel, bolt on vertical, weld on horizontal •	Rear Door-swing with .5” composite with dual gaskets & stainless steel cover sheet, 1 lock rod & 4 hinges per door •	Roof Sheet-Aluminum •	Roof Bows-1” galvanized I-beam on 24” centers •	Scuffband-10” high 18 gauge roll-form galvanized steel installed at floor level overlaid on lining •	Floor-1.38” laminated hardwood with 2 screws per floor board per crossmember, Steel Diamondette threshold 0.125” x 12” deep •	Interior Lining-front .5” plywood 48” high & .25” plywood to ceiling, side extruded polyethylene recessed between uprights, ceiling none •	Upper Coupler-3.5” channel, floor butted to coupler •	Bottom Plate-.25” thick •	Landing Gear-GD60, 10” x 10” cushion foot, roadside handle, located 98.5” from king pin •	Crossmembers-2” deep steel hat 12” centers ahead of landing gear, 4” steel I-beam 12” centers over landing gear, 4” steel I-beam 12” centers in bay area, 4” steel I-beam 12” centers over slider rail •	Suspension-Hendrickson HKANT40K air ride slide, 49” tandem axle, manual dump va, 210” P-series slide length, & air assist pin puller •	Axles-Hendrickson standard wall with tapered spindle and Meritor PSI tire inflation system •	Brakes-16.5” x 7” with Great Dane 2.5” stroke actuators, Hendrickson extended service shoes, & Meritor Automatic 5.5” adjusters •	ABS-WABCO 2S/1M Easy Stop with Sealco brake valves •	Mudflaps-1 pair of Jim Hawk logo mounted on undercarriage •	Hub/Wheel & Drum-Great Dane hub piloted universal 10 stud hub with outboard cast drums •	Wheels-22.5” x 8.25” hub piloted aluminum disc wheels, standard polish inboard; mirror polish dish side outboard •	Tires-295/75R22.5 Bridgestone Ecopia R197 (G) •	Wheel Seals & Lubricant-Stemco Platinum-Plus Performance Package & Kendall EBL grease •	Axle Spindle Nuts-Pro-Torq Spindle Nut •	Wiring Harness- Grote Long Life lighting system •	Exterior Lights-Grote LED MicroNova DOT lights, front-1 top mounted on corner at 45° r/s & c/s, rear header-center cluster of 3 w/ dual intensity brake indication & 1 each outboard corner, buckplate-3 each side stop/tail/red turn, side rails-5 each top & bottom rails; LED mid ship turn signal-attached to crossmember flush w/ bottom rail, centered on r/s & c/s, turn & clearance •	Electrical connection-Great Dane 7 way, solid pins •	Undercarriage Finish-Black undercoat GREAT DANE QUALITY FEATURES •	Four nose post hat section-2.5” x 5” 16 gauge steel. •	2” deep steel hat section anti-snag crossmembers over drive tires. •	Nylon bushings in lock rods with bearing plate for easy operation. •	Wiring & air system cables run above crossmembers, lowers maintenance costs. •	Protective aluminum cap around entire roof perimeter. •	3.5” joggle upper coupler. •	Solid hubcap.